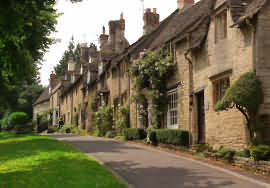 Burford is situated in north Oxfordshire, twenty miles west of Oxford, and is considered the southern gateway to the Cotswolds. A beautiful old Cotswold town, its High Street sloping from the high Wolds, where you have beautiful views over the open countryside, down to the willow fringed River Windrush in the pretty Windrush valley. A fine three arched medieval bridge crosses the river at the foot of the hill. 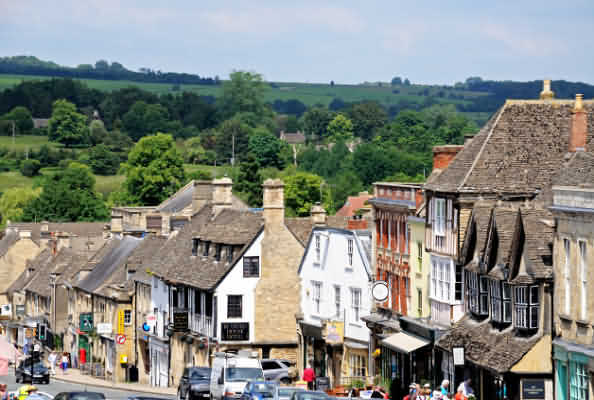 The beautiful town of Burford on the river Windrush was the site of a fortified ford in Anglo-Saxon times. 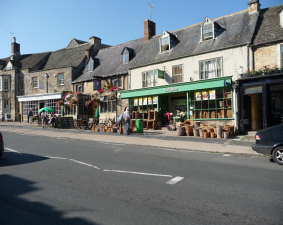 The town grew to be an important crossroads and very wealthy wool town and is today very popular with visitors. 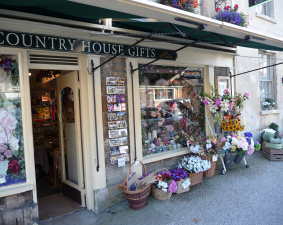 The broad main street slopes gently down to the river and is lined with dignified old houses and ancient cottages and many shops all of which appear little changed since Tudor times as witnessed by the precarious angles the buildings have come to rest at. 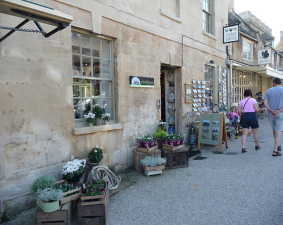 There are wonderful little side streets to explore, old pubs, tea and antique shops aplenty. The 15th century parish church of St. John Baptist is magnificent and is another sign of byegone riches based on wool. Exploring the streets, shopping, and dining in the many pubs, restaurants, and tea shops. 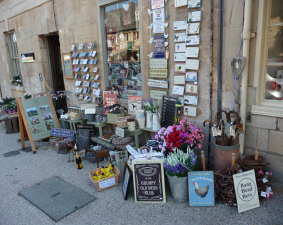 Since 2001 - the Cotswold Town of Burford is Twinned with the Italian Town Potenza Picena in the Marche region of Italy. 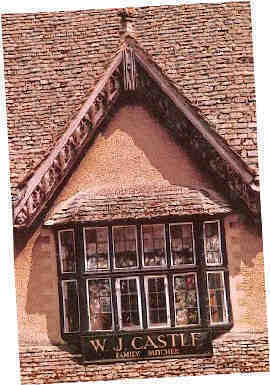 Among the half-timbered buidings you will find the town's museum, The Tolsey, an early Tudor building on stone pillars. In times gone bye Wool Merchants would meet in the open space underneath and conduct their trading transactions. Above there are two small rooms of exhibits which tell of the trades that once flourished, from bell-founding and brewing , to leatherworking and clarinet making. The museum is open every year from April to October, afternoons Tuesday to Sunday. Broadway 35 minutes, Stratford-upon-Avon 45 minutes, Bath 60 minutes. A pivotal point in the English Civil War. The king was dead, and the future....??????? Hidden English History: It was May 1649, the end of the English Civil War. A mass of troops were being disbanded in Salisbury without pay and with little prospect of getting what they had been fighting for. Eight hundred troops sacked their officers, elected new ones and marched north, over several days, to Burford, with Cromwell on their heels. Despite his promise of peaceful negotiations the following day, Cromwell charged into the town at midnight with 2,000 horsemen. 340 of the Levellers were rounded up and imprisoned in Burford church, where carvings from the incarcerated soldiers can still be seen to this day. Next morning three of the leading Leveller soldiers were summarily executed against the church wall, where you can still see the bullet holes. The following night Cromwell was treated to a slap-up banquet and awarded an honorary degree at Magdalen College Oxford. The last thing Cromwell wanted was democracy. If the Levellers had held Cromwell to the pledge of a democratic army which he gave in the Solemn Engagement of New Market and Triplo Heath in 1647.... a very different world would have been inherited by the present generation. Open-air event at Warwick Hall Garden, Burford, Oxfordshire - Annual Levellers Day. Speeches, debate, procession, music. See our Cotswolds Calendar for details of the current year event.
" the church Sir is mine, and if I choose to I shall stand on my head in it'. This inspired William Morris to establish ths Society for the Protection of Ancient Buildings. 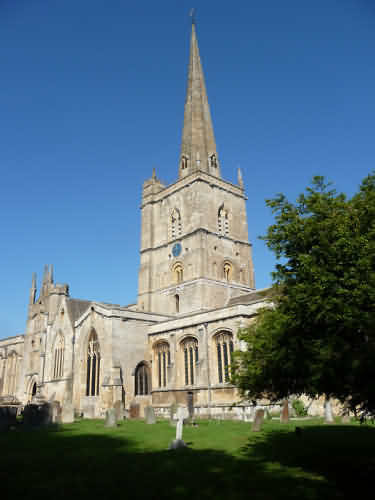 The church was chosen as one of the top 20 by Simon Jenkins in his England's Thousand Best Churches.